HOUSTON -- This game’s crazy finish had it all: Houston Rockets coach Mike D'Antoni learned about an obscure rule, Boston Celtics coach Brad Stevens became miffed when a video review didn't go his team's way, and one of the game’s most accurate finishers missed a potential game-winner near the rim. After all that, Houston held on to defeat Boston, 107-106, on Monday night. The Celtics failed to close out after leading by eight with about seven minutes left in the fourth quarter. James Harden took over the game, scoring nine of the final 11 points for the Rockets to finish with 37 while making just eight shots from the field. Harden was an amazing 18-for-18 from the line, becoming the first player since the NBA/ABA merger to make that many free throws without a miss against the Celtics. But it was a Harden elbow and a replay review that nearly changed the outcome. Avery Bradley nailed a long 2-pointer with 46.9 seconds left that cut the Rockets' lead to 107-104. A review of the play confirmed the 2-pointer, though Stevens and the Celtics weren't convinced. Replays seemed to show Bradley with his toes just behind the black 3-point line. Houston still needed to close out the game and Harden was double-teamed near the Rockets' bench by Marcus Smart and Bradley. Harden swung his right elbow, knocking Smart to the floor. The Rockets weren't happy, thinking Harden was fouled before he moved his arms near the head of Smart. D’Antoni said he was about to call a timeout before the referee whistled a foul. The refs reviewed the play and ruled it was a flagrant 1. 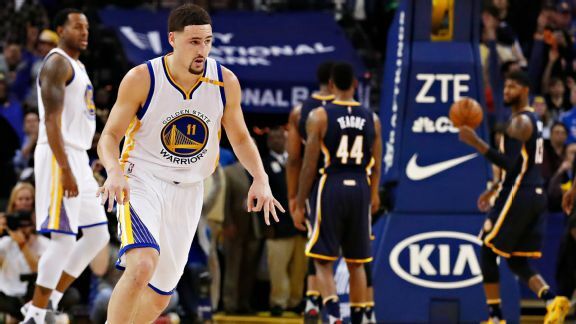 Golden State guard Klay Thompson was at 60 points and climbing when a lopsided game put him on the bench. What was interesting about the call was the scoreboard. There was all sorts of confusion regarding how many fouls the Rockets had been called for. The scoreboard had the Rockets committing just two team fouls. So after Smart made two free throws with 16.2 seconds left to cut the deficit to a single point, D’Antoni wanted the Rockets to foul because he thought his team hadn’t been penalized for any fouls under two minutes. A flagrant foul, indeed, counts as a team foul. D’Antoni and his coaches quickly waved off fouling because another would have been the second team foul in the last two minutes of the game and would have sent the Celtics to the line. “A lot of confusion, let’s put it that way,” D’Antoni said. The Rockets didn’t foul and Isaiah Thomas missed a layup, but when the ball went out of bounds off the Rockets, it set up one more play with 5.2 seconds left. Al Horford broke free from Beverley and drove to the lane, but missed a layup with 0.8 seconds remaining. It was a shocker to see Horford miss a layup. In the past five seasons, he has the third-highest field goal percentage on shots fewer than four feet from the rim. Only LeBron James and Kevin Durant are better.